When building a new house or retrofitting an older one for tunnel ventilation, fan selection is one of the most, if not the most important decision a producer has to make. A house’s fans are essentially the engine of the ventilation system and as a result have a significant effect on a producer’s ability to maintain the proper environmental conditions throughout the year. Furthermore, with rising electricity prices selecting the right energy efficient fan can save a producer thousands of dollars a year. As a result, when selecting fans it is crucial that a producer compares fans not just on initial cost but on fan performance and operating costs as well. University of Illinois BESS Laboratory “Agricultural Ventilation Fans Performance and Efficiencies” test booklet is the leading source for agricultural fan performance data (an electronic version of the test booklet can be found at www.bess.uiuc.edu.) Along with a fan’s air moving capacity at various static pressures BESS Laboratory provides producers information on a fan’s energy efficiency rating (cfm/watt) and air flow ratio (an indicator of how well the fan holds up under high static pressures). 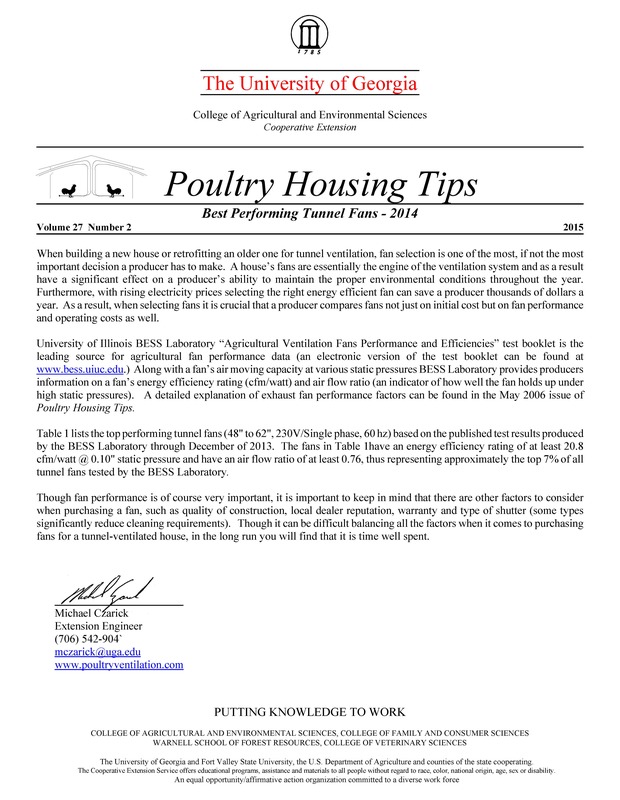 A detailed explanation of exhaust fan performance factors can be found in the May 2006 issue of Poultry Housing Tips. Table 1 lists the top performing tunnel fans (48" to 62", 230V/Single phase, 60 hz) based on the published test results produced by the BESS Laboratory through December of 2013. The fans in Table 1have an energy efficiency rating of at least 20.8 cfm/watt @ 0.10" static pressure and have an air flow ratio of at least 0.76, thus representing approximately the top 7% of all tunnel fans tested by the BESS Laboratory. Though fan performance is of course very important, it is important to keep in mind that there are other factors to consider when purchasing a fan, such as quality of construction, local dealer reputation, warranty and type of shutter (some types significantly reduce cleaning requirements). Though it can be difficult balancing all the factors when it comes to purchasing fans for a tunnel-ventilated house, in the long run you will find that it is time well spent.